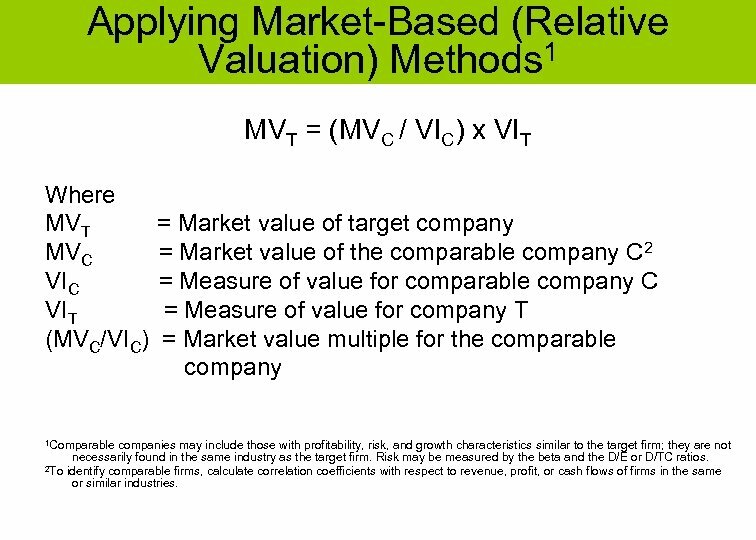 Applying Market-Based (Relative Valuation) Methods 1 MVT = (MVC / VIC) x VIT Where MVT MVC VIT (MVC/VIC) 1 Comparable = Market value of target company = Market value of the comparable company C 2 = Measure of value for comparable company C = Measure of value for company T = Market value multiple for the comparable company companies may include those with profitability, risk, and growth characteristics similar to the target firm; they are not necessarily found in the same industry as the target firm. Risk may be measured by the beta and the D/E or D/TC ratios. 2 To identify comparable firms, calculate correlation coefficients with respect to revenue, profit, or cash flows of firms in the same or similar industries. 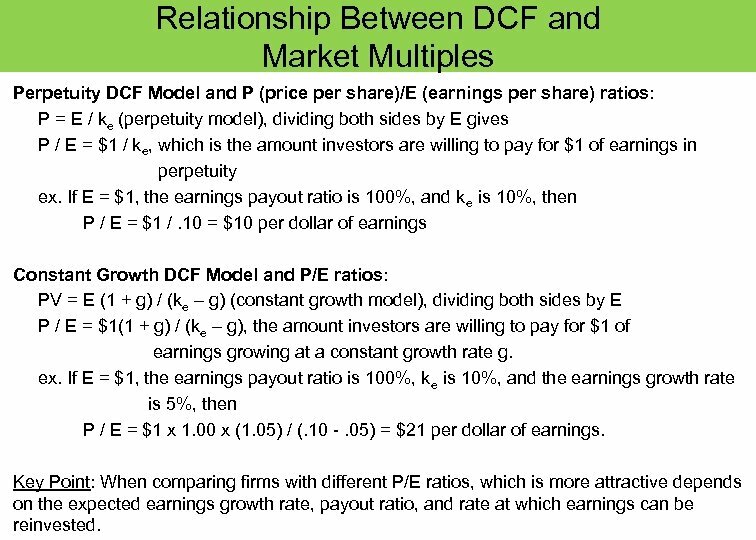 Relationship Between DCF and Market Multiples Perpetuity DCF Model and P (price per share)/E (earnings per share) ratios: P = E / ke (perpetuity model), dividing both sides by E gives P / E = $1 / ke, which is the amount investors are willing to pay for $1 of earnings in perpetuity ex. If E = $1, the earnings payout ratio is 100%, and ke is 10%, then P / E = $1 /. 10 = $10 per dollar of earnings Constant Growth DCF Model and P/E ratios: PV = E (1 + g) / (ke – g) (constant growth model), dividing both sides by E P / E = $1(1 + g) / (ke – g), the amount investors are willing to pay for $1 of earnings growing at a constant growth rate g. ex. If E = $1, the earnings payout ratio is 100%, ke is 10%, and the earnings growth rate is 5%, then P / E = $1 x 1. 00 x (1. 05) / (. 10 -. 05) = $21 per dollar of earnings. Key Point: When comparing firms with different P/E ratios, which is more attractive depends on the expected earnings growth rate, payout ratio, and rate at which earnings can be reinvested. 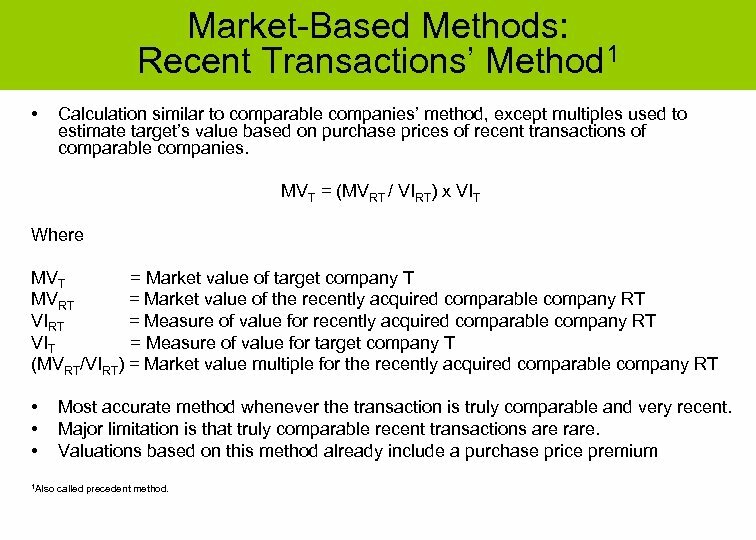 Market-Based Methods: Recent Transactions’ Method 1 • Calculation similar to comparable companies’ method, except multiples used to estimate target’s value based on purchase prices of recent transactions of comparable companies. MVT = (MVRT / VIRT) x VIT Where MVT = Market value of target company T MVRT = Market value of the recently acquired comparable company RT VIRT = Measure of value for recently acquired comparable company RT VIT = Measure of value for target company T (MVRT/VIRT) = Market value multiple for the recently acquired comparable company RT • • • Most accurate method whenever the transaction is truly comparable and very recent. Major limitation is that truly comparable recent transactions are rare. 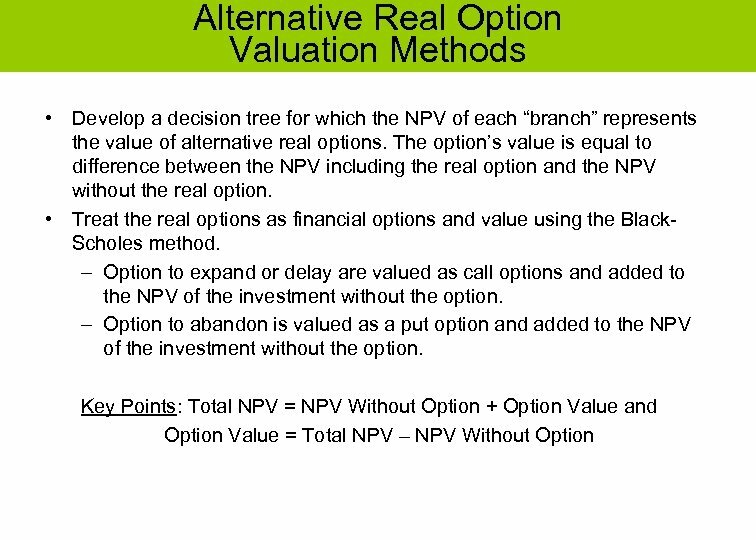 Valuations based on this method already include a purchase price premium 1 Also called precedent method. 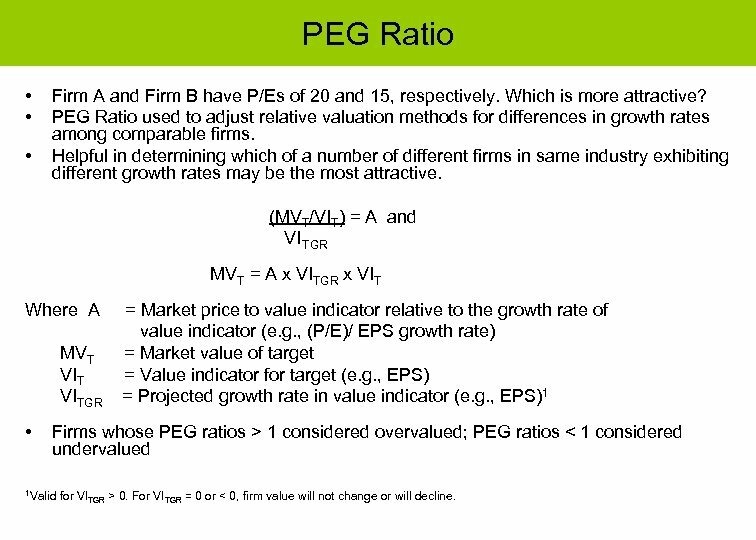 PEG Ratio • • • Firm A and Firm B have P/Es of 20 and 15, respectively. Which is more attractive? PEG Ratio used to adjust relative valuation methods for differences in growth rates among comparable firms. Helpful in determining which of a number of different firms in same industry exhibiting different growth rates may be the most attractive. 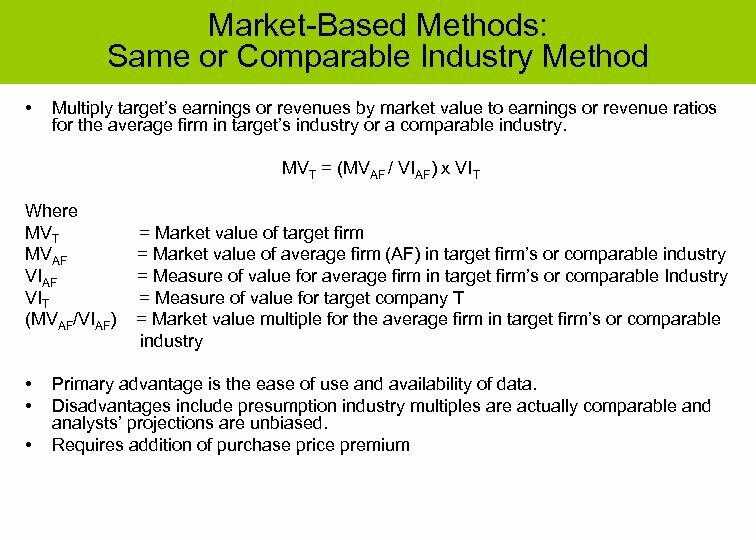 (MVT/VIT) = A and VI TGR MVT = A x VITGR x VIT Where A MVT VITGR • = Market price to value indicator relative to the growth rate of value indicator (e. g. , (P/E)/ EPS growth rate) = Market value of target = Value indicator for target (e. g. , EPS) = Projected growth rate in value indicator (e. g. , EPS)1 Firms whose PEG ratios > 1 considered overvalued; PEG ratios < 1 considered undervalued 1 Valid for VITGR > 0. For VITGR = 0 or < 0, firm value will not change or will decline. 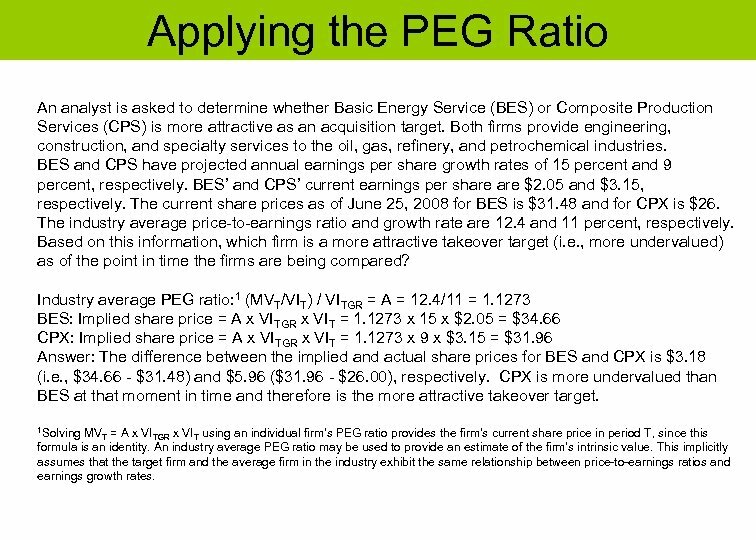 Applying the PEG Ratio An analyst is asked to determine whether Basic Energy Service (BES) or Composite Production Services (CPS) is more attractive as an acquisition target. Both firms provide engineering, construction, and specialty services to the oil, gas, refinery, and petrochemical industries. BES and CPS have projected annual earnings per share growth rates of 15 percent and 9 percent, respectively. BES’ and CPS’ current earnings per share $2. 05 and $3. 15, respectively. The current share prices as of June 25, 2008 for BES is $31. 48 and for CPX is $26. The industry average price-to-earnings ratio and growth rate are 12. 4 and 11 percent, respectively. Based on this information, which firm is a more attractive takeover target (i. e. , more undervalued) as of the point in time the firms are being compared? Industry average PEG ratio: 1 (MVT/VIT) / VITGR = A = 12. 4/11 = 1. 1273 BES: Implied share price = A x VITGR x VIT = 1. 1273 x 15 x $2. 05 = $34. 66 CPX: Implied share price = A x VITGR x VIT = 1. 1273 x 9 x $3. 15 = $31. 96 Answer: The difference between the implied and actual share prices for BES and CPX is $3. 18 (i. e. , $34. 66 - $31. 48) and $5. 96 ($31. 96 - $26. 00), respectively. CPX is more undervalued than BES at that moment in time and therefore is the more attractive takeover target. 1 Solving MVT = A x VITGR x VIT using an individual firm’s PEG ratio provides the firm’s current share price in period T, since this formula is an identity. An industry average PEG ratio may be used to provide an estimate of the firm’s intrinsic value. This implicitly assumes that the target firm and the average firm in the industry exhibit the same relationship between price-to-earnings ratios and earnings growth rates. Valuing Companies Using Asset Based Methods: Practice Problem Ingram Micro distributes information technology products worldwide. The firm’s share price on 8/21/08 was $19. 30. Projected 5 -year annual net income growth is 9. 5% and the firm’s beta is. 89. Shareholders’ equity is $3. 4 billion and goodwill is $. 7 billion. Ingram has 172 million (. 172 billion) shares outstanding. The following firms represent Ingram’s primary competitors. Note that Synnex Corporation can be viewed as an outlier. Market Value/ Tangible Book Value Beta Projected 5 -Year Net Income Growth Rate (%) Tech Data . 91 . 90 11. 6 Synnex Corporation . 70 . 40 6. 9 Avnet 1. 01 1. 09 12. 1 Arrow . 93 . 97 13. 2 Based on this information, what is Ingram’s tangible book value per share (VIT)? What is the appropriate industry average market value to tangible book value ratio (MVIND/VIIND)? 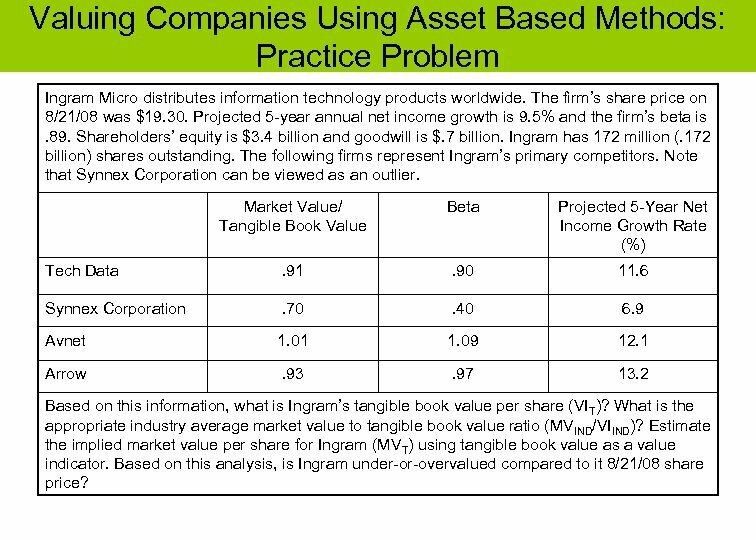 Estimate the implied market value per share for Ingram (MVT) using tangible book value as a value indicator. Based on this analysis, is Ingram under-or-overvalued compared to it 8/21/08 share price? 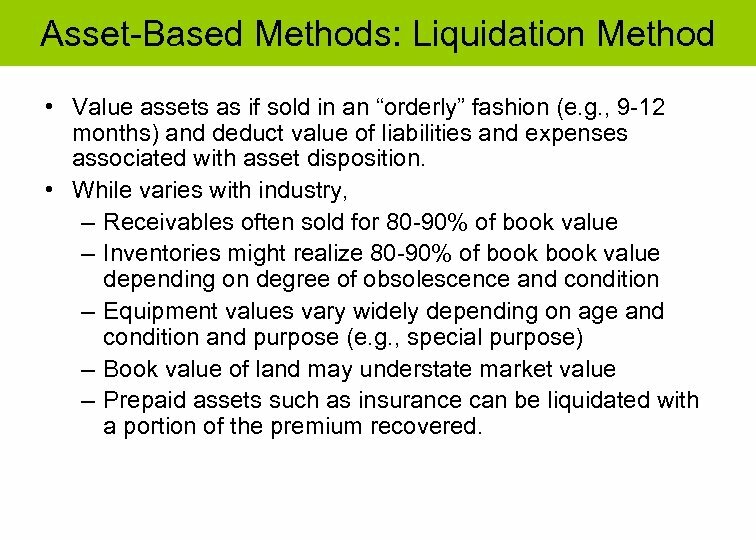 Asset-Based Methods: Liquidation Method • Value assets as if sold in an “orderly” fashion (e. g. , 9 -12 months) and deduct value of liabilities and expenses associated with asset disposition. 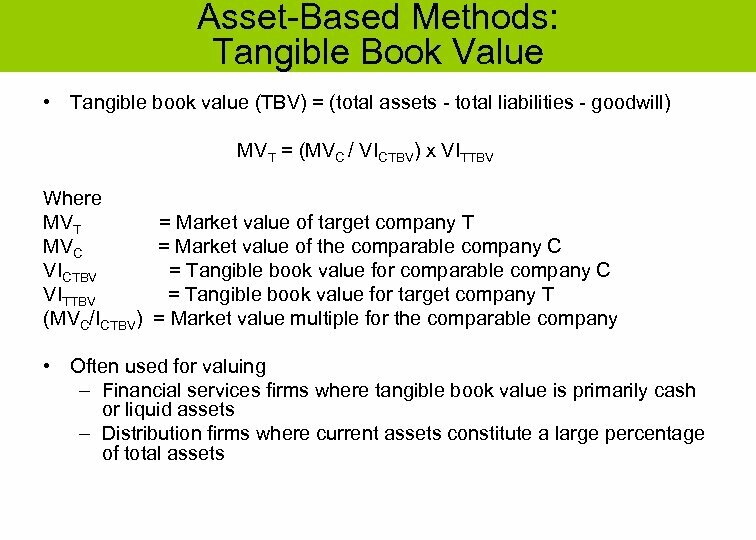 • While varies with industry, – Receivables often sold for 80 -90% of book value – Inventories might realize 80 -90% of book value depending on degree of obsolescence and condition – Equipment values vary widely depending on age and condition and purpose (e. g. , special purpose) – Book value of land may understate market value – Prepaid assets such as insurance can be liquidated with a portion of the premium recovered. 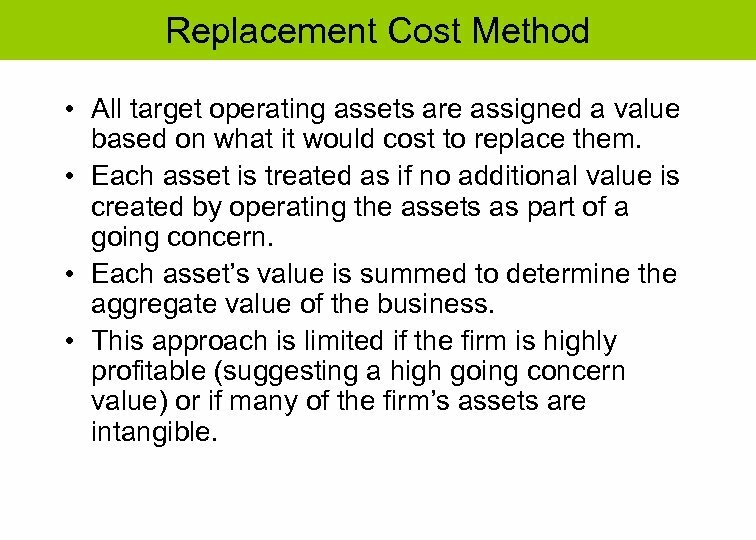 Replacement Cost Method • All target operating assets are assigned a value based on what it would cost to replace them. • Each asset is treated as if no additional value is created by operating the assets as part of a going concern. 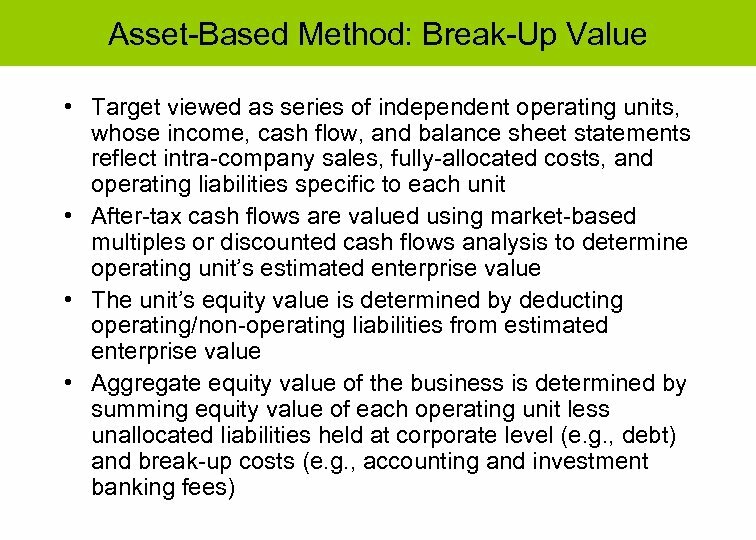 • Each asset’s value is summed to determine the aggregate value of the business. • This approach is limited if the firm is highly profitable (suggesting a high going concern value) or if many of the firm’s assets are intangible. 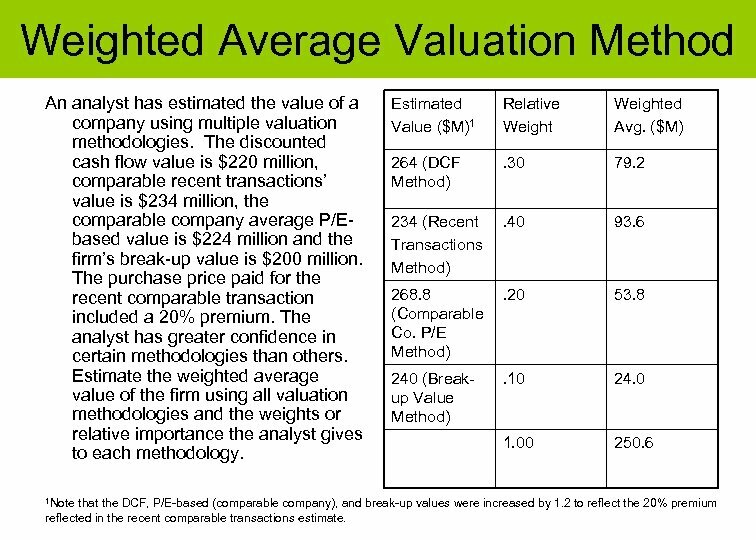 Weighted Average Valuation Method An analyst has estimated the value of a company using multiple valuation methodologies. The discounted cash flow value is $220 million, comparable recent transactions’ value is $234 million, the comparable company average P/Ebased value is $224 million and the firm’s break-up value is $200 million. The purchase price paid for the recent comparable transaction included a 20% premium. The analyst has greater confidence in certain methodologies than others. Estimate the weighted average value of the firm using all valuation methodologies and the weights or relative importance the analyst gives to each methodology. 1 Note Estimated Value ($M)1 Relative Weighted Avg. ($M) 264 (DCF Method) . 30 79. 2 234 (Recent Transactions Method) . 40 93. 6 268. 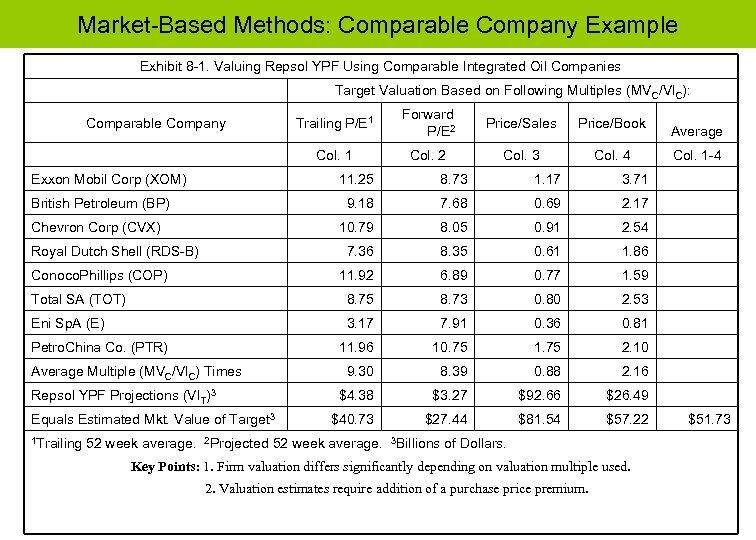 8 (Comparable Co. P/E Method) . 20 53. 8 240 (Breakup Value Method) . 10 24. 0 1. 00 250. 6 that the DCF, P/E-based (comparable company), and break-up values were increased by 1. 2 to reflect the 20% premium reflected in the recent comparable transactions estimate. 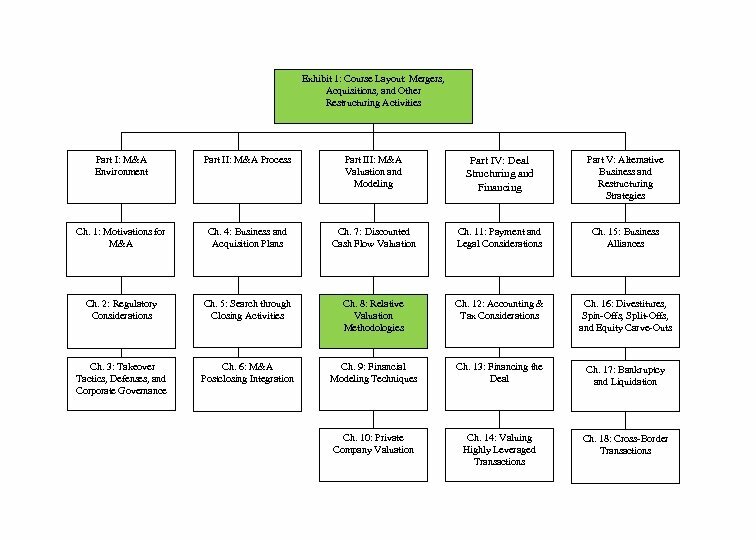 Microsoft Real Options Decision Tree in 2008 Attempted Takeover of Yahoo Option to expand contingent on successful Integration of Yahoo & MSN Base Case: Microsoft Offers To Buy All Yahoo Shares in 2008 Option to postpone contingent on Yahoo’s rejection of offer Embedded Options Purchase Yahoo online search only. Buy remaining businesses later. Enter long-term search partnership. Implemented in 2010. 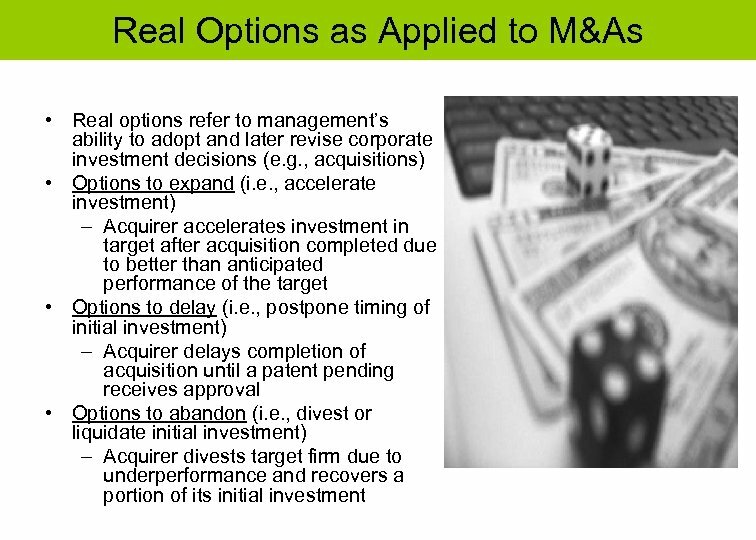 Offer revised price for all of Yahoo if circumstances change Option to abandon contingent on failure to integrate Yahoo & MSN Spin off combined Yahoo and MSN to Microsoft shareholders Divest combined Yahoo & MSN. 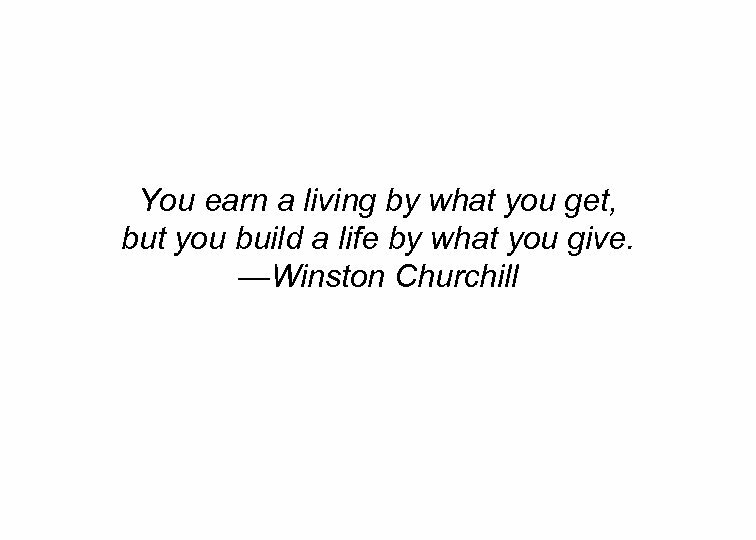 Use proceeds to pay dividend or buy back stock. Discussion Questions 1. 2. 3. 4. 5. Does the application of the comparable companies valuation method require the addition of an acquisition premium? Why or why not? Which is generally considered more accurate: the comparable companies or recent transactions method? Explain your answer. 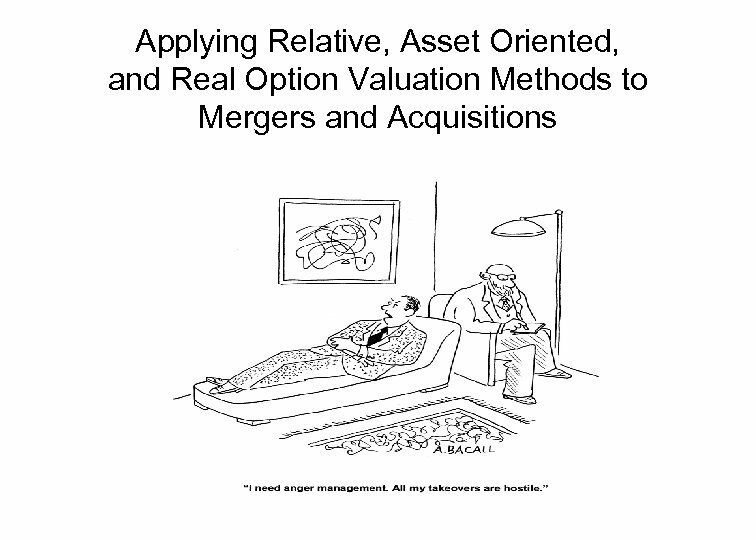 What key assumptions are implicit in the comparable companies valuation method? The recent comparable transactions method? 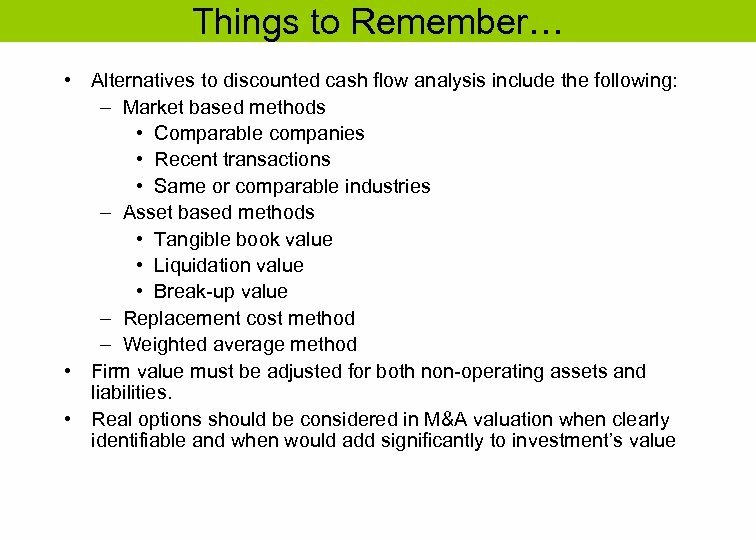 Explain the primary differences between the income (discounted cash flow), market-based, and asset-oriented valuation methods? 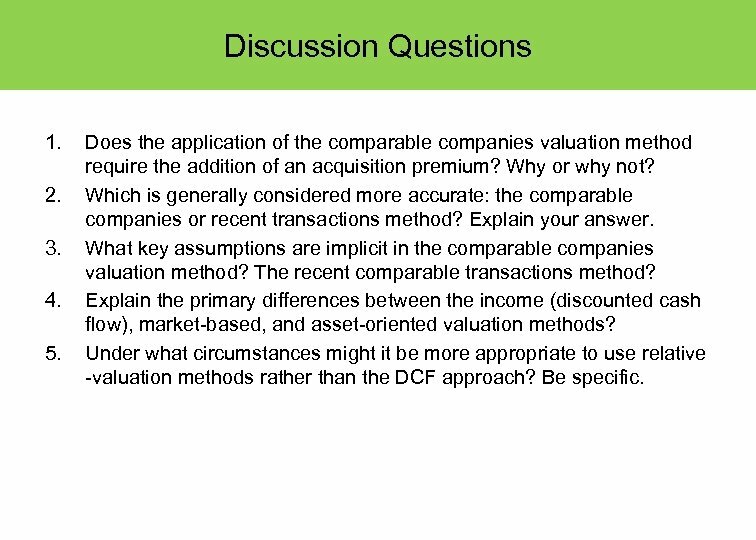 Under what circumstances might it be more appropriate to use relative -valuation methods rather than the DCF approach? Be specific.